Jellies were often savoury dishes, used to extend and preserve offcuts and left over meats. Brawn and presswurst are remnants of this craft. Jelly was also used to ‘sculpt’ sweet and savoury dishes, formed into whimsical shapes to look appealing at the table. But jellies are not as simple and fun as they seem, one of the key philosophical points that artist Janet Tavener’s ‘Out of the mould’ exhibition at Vaucluse House demonstrated. ‘Forcing food to take on bizarre and convoluted shapes can be read as a metaphor for man’s obsessive attempts to control the inexorable power of nature.’ (Tracey Clement, 2010). Sweet jellies would be both clear and solid coloured – known as flummeries, or the French term, blancmange, made with almond milk. 18th century cookbooks include dishes such as ‘fish ponds’, ‘moon & stars’, ‘hen’s nests’, even ‘bacon & eggs’ made with flummery. Jelly moulds gradually eclipsed the ‘free formed’ style jellies, although some of us revisit the practice today, creating novelty jellies for children’s birthday parties (e.g. ‘frogs in a pond’). A variety of late nineteenth century copper moulds are on display at Vaucluse House as part of their batterie de cuisine. Decorative ‘ring’ moulds were used for jellies or flummeries. Once the jelly had set the centre would be filled with fresh fruit or whipped cream. They were also used to make moulded rice ‘casseroles’ or mashed potatoes with the centre filled with curry or ragout – a little serving trick my mother used as I was growing up in the 70s! While making jelly is now a simple two step process it was once labour intensive and protracted, reserved for households that could afford the time and fuel for frivolity at the table. Until commercial production of gelatine was pioneered in the mid-nineteenth century, food could be set using isinglass, made from an extract from the swim bladder of a sturgeon, hart’s horn (i.e. deer horn) and calf’s feet. ‘Chinese’ gelatine, or agar-agar started to appear in colonial cookbooks towards the end of the nineteenth century; it had the distinct advantage of not needing cold temperatures to set. But most cookery books of the time indicate that calf’s foot jelly was still the most common form of gelatine in domestic cookery, for both sweet and savoury dishes. If the weather wasn’t cool enough for your dish to set, common practice was to place your mould into a bucket and suspend it in the well (usually located close to the kitchen) just above the waterline. Here is an example of an 18th century calf’s foot jelly recipe. Note the opening line: the ‘receipt’ as recipes were then known, requires a ‘gang’ of calf’s feet. Not knowing exactly what a ‘gang’ would be, I deduced it would be a set of four. Further research on old usage of words has revealed that a ‘gang’ is indeed a ‘set’ so given that calves have four legs, my instinct was right [and a note on old texts – the letter s is often printed as f]. I trialed this recipe using only one foot, which yielded one cup of clarified gelatine (see process images below) so a ‘gang’ would yield about a litre. As you’ll see, those little Aeroplane packets save us a lot of work and may also explain why jelly has become a somewhat trivialised rather than revered food. Calves' feet can be difficult to find in conventional butchers shops, but can be purchased in suburbs that cater for Korean and Chinese communities, such as Campsie or Ashfield in Sydney. More than just the hoof, a calf's 'foot' can be up to 30 cm long, and as they are nearly all bone, ask the butcher to cut each one into three or four pieces so they'll fit into a domestic pot (albeit a large one!). 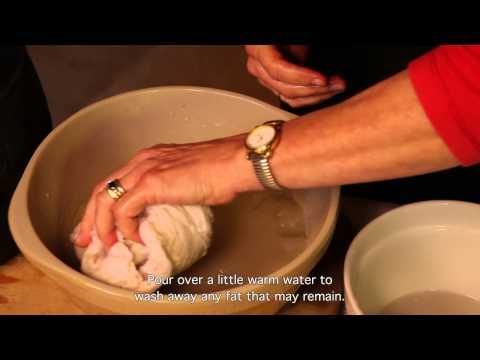 Making gelatine this traditional way is at least a two-day process. Place the calves' feet pieces into a lidded stockpot or large saucepan and add just enough water to cover. Cook, partially covered, on a medium heat to maintain a strong simmer for about 2 hours. Strain the extracted liquid through a sieve lined with muslin or clean kitchen cloth, discarding any solids. Refrigerate the liquid for several hours or overnight to allow any fat to rise to the surface. Skim off as much of the oily layer as possible using a large metal spoon. You will be left with a dense jellied mass which then needs to be clarified. Combine the beaten egg whites with the crushed eggshells and place the mixture in a medium sized saucepan with the calf’s foot extract over a low heat. Bring to a gentle simmer and cook for 10–15 minutes. As the liquid simmers the impurities are drawn into the egg white and eggshell mixture. Skim the surface of the liquid carefully and strain the jelly through fine muslin, discarding any solids. Refrigerate until set. The jelly should be able to hold its form quite strongly; if it is still liquid, reduce by boiling it on the stove to the desired concentration. Melt the 'solid' jelly in a pan over low heat and strain again through a dampened linen tea towel or muslin, using a very fine strainer. The clear jelly is now ready to flavour for use in any recipe calling for jelly - usually this would be with some white wine, orange blossom water or lemon juice. The jelly would be coloured with natural food dyes such as spinach, beetroot juice or a saffron infusion. Calf’s foot jellies remained in cookbooks well into the twentieth century, generally as ‘invalid’s’ food, as the resulting jelly is almost pure protein and completely fat free and was seen as nutritious and easy to digest. As it turns out, calf’s-feet jelly is not the ‘wonderfood’ it was believed to be. Although almost pure protein, it is not a ‘complete protein’ food as it lacks tryptophan, an essential amino acid, but jelly remains a staple hospital food.